Oaktree Interiors' specialist team have been appointed to carry out a complete office Design & Build project for Uniface UK's brand new Slough office for the New Year. Here at Oaktree, we are extremely proud of our history of creating fantastic and unique workplace designs and bespoke office refurbishment in Berkshire. Who Are Uniface UK Ltd? Uniface is one of the world's leading providers of model-driven, low-code application development and deployment technology. The software that they create is primarily used by enterprise businesses, software integrators and independent software vendors (ISVs). Uniface's main HQ is in the Netherlands, but the company also has American offices located in Detroit. They are proud to say that they can create great applications, fast, for a diverse range of clients and customers all across the world, particularly through their interlinked network of highly-skilled partners and associates. The technology that Uniface provides can help companies to quickly and efficiently evolve to ensure that they are able to meet their customers' preferences. Uniface UK's Office Refurbishment In Berkshire! Currently, Uniface UK are based in serviced office space, and have been considering the move to conventional office space in Slough for some time. 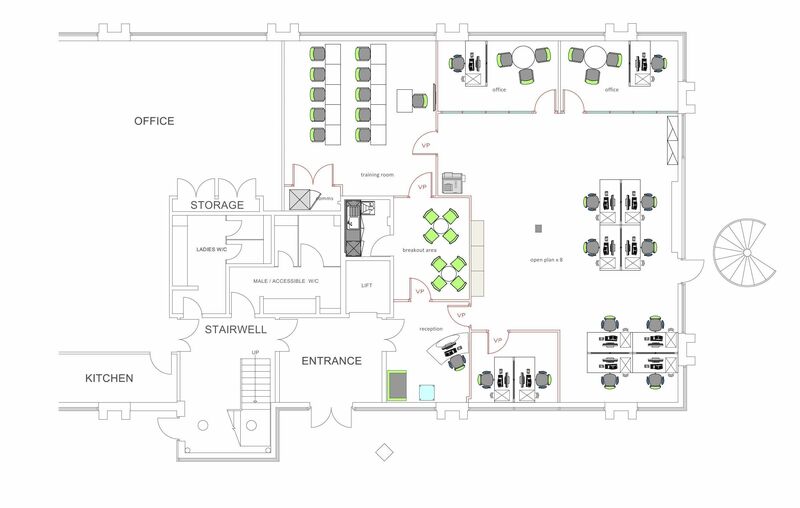 The Oaktree team were invited to propose space plans for the new layout in the event of a move to traditional space. After Uniface selected an office space on Berwick Avenue, Slough, Berkshire, our team got in touch with Uniface's Procurement & Facilities Manager in their Amsterdam offices. Our very own MD, Perry Mills, conducted on-site survey's to truly get a feel for the best possible use of the space, and it wasn't long after that we were asked to provide a fresh, modern office refurbishment in Berkshire, which still allowed the office room to grow and attract new talent. With a modern, open-plan design, expansion will be extremely easy and allows the company to employ more talented professionals, without cutting into the current working space enjoyed by current employees. Aside from the open-area design, it was also important the office space itself featured a range of bespoke features to allow the company to operate effectively. Our team provided new managers' offices, a new executive office; a large meeting room/training room which can be adapted depending on the user's needs, a reception and comfortable waiting area as well as essential employee features, including a unique tea-point/breakout area. Keeping with the theme of modern and open office design, we also provided a clever mixture of solid and glass wall partitions, to allow easy interaction between employees but also to provide privacy around sensitive areas within the office itself. To ensure that Uniface's talented workforce are able to work at their peak efficiency, we also ensured that the entire space enjoyed completely new and optimised mechanical and electrical infrastructure services. Storage was a particular priority for many of the employees here, and so we included mid-height cupboards and personal storage via under desk pedestals to ensure that the office could retain its sleek and modern design. Are You Looking For Reliable And Bespoke Office Refurbishment In Berkshire? Whether you're looking for a comprehensive office refurbishment service in Berkshire or just some advice about how to overcome immediate problems with your office design, you can always get in touch with our professional team today on 0118 979 6600. If you have any specific questions or concerns, then why not email our specialists directly at hello@oaktreeoffice.com.